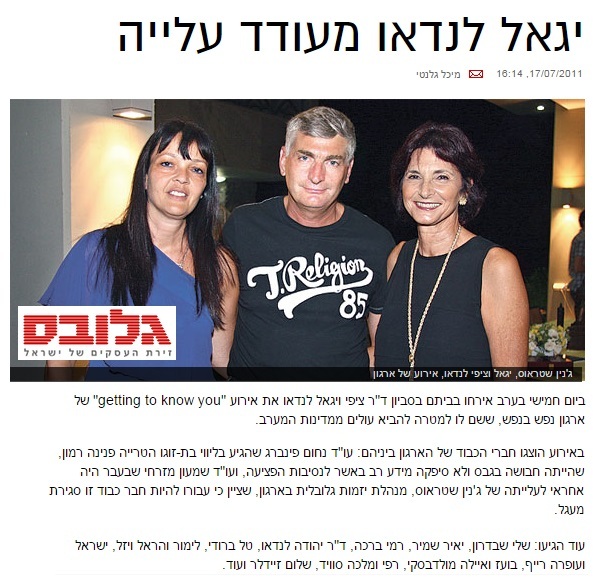 According to Globes, Ratio CEO Yigal Landau, and his wife Dr. Tzipi Landau, hosted an event organized by Nefesh B’Nefesh titled “Getting to Know You.” Nefesh B’Nefesh works to bring new immigrants to Israel from countries in the western hemisphere. The event was attended by honorary Nefesh B’Nefesh members Nahum Feinberg and Shimon Mizrahi. Also in attendance were Yair Shamir, Dr. Yehuda Landau, Boaz and Ayala Moldavsky, Limor and Harel Vizel, Tal Brody, and others. Yigal Landau is known for frequenting various fundraising and charity events, and for being involved in a wide range of activities in the public arena. This entry was posted in In the Media, Public Activities and tagged charity events, Nefesh B'Nefesh, new immigrants, Ratio CEO Yigal Landau. Bookmark the permalink. (Photo: Dudu Bachar, TheMarker) Businessman and entrepreneur - Director and General Manager of Ratio since its establishment.